While doing a good deed on Thanksgiving afternoon I was well rewarded. When we left Socorro it was raining. The recipient of the good deed wanted to know if it was “worth it” to go to the refuge. I said, “At Bosque, we pray for bad weather. 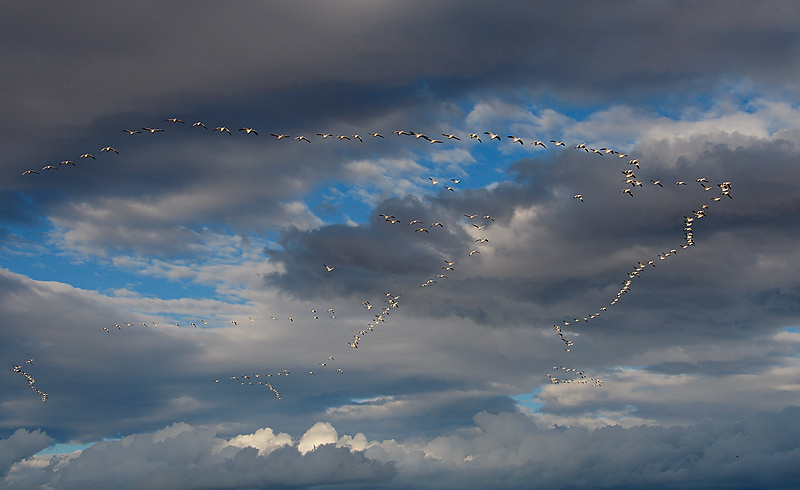 Clear skies and the challenging northwest winds are all too common.” As we drove north on the East Farm Loop Road and admired the incredible clouds, long skeins of geese filled the skies, but the sun angle was wrong. When we got to the area just before the Farm Deck, the sun angle was perfect but there were no birds. We had to wait only a few minutes until the bird from the corn fields in the north end of the refuge once again filled the skies. Above is the image that I visualized as we headed north…. Know someone who will be visiting Bosque soon? 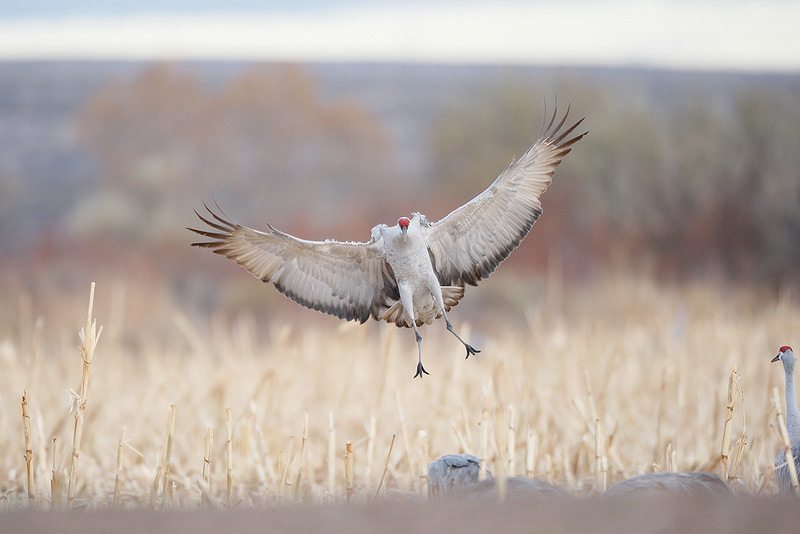 Learn more about the Bosque Site Guide here: http://www.birdsasart.com/siteguides.htm#BOSQUE%20SITE%20GUIDE%20NOW%20AVAILABLE! Canon 800mm f/5.6L IS lens with the Canon EOS-1D MIII on the Mongoose M3.5 (http://tinyurl.com/68nxhy) atop the Gitzo 3530 LS CF tripod (http://tinyurl.com/65edtk). ISO 1000. Evaluative metering +2 stops of the dull sky: 1/500 sec. at f/5.6 in Manual mode. create flight images without the 1.4X teleconverter is a huge advantage as AI Servo AF tracking accuracy is greatly improved. Here I love the fall color/corn field background colors. To create the optimized image above I cropped the original image below, Patch Tooled away some of the more obtrusive corn stalks, created a Quick Mask) of the corn field background (as described in Robert O’Toole’s APTATS PDF, and then did a Gaussian Blur on the Layer Mask. Then the standard BAA workflow as covered in Digital Basics and ABP II. Experience Central Florida, FEB 6-8, 2009. 3-DAY (multi-location): $799. (Limit 10). Experience Gatorland, MAR 6-8 (nest building and courtship behaviors) and MAY 1-3 (chicks in the nests). 3-DAY (multi-location): $699. (Limit 10). Each of the above includes in-the-field and in-classroom instruction and a multitude of subjects. Contact Robert by cell phone at 407-808-7417 or by e-mail at wildscapeimages@comcast.net. Join Robert Amoruso for a unique journey photographing moose and more in Maine. The workshop will be headquartered in Millinocket. We will enjoy the services of a local guide with more than forty-five years of experience. The June workshop is timed for mothers with calves and the October workshop for bull moose and fall foliage. We will explore for wildlife and landscape opportunities in Baxter State Park and surrounding areas. Known for their tolerance of humans, Maine moose allow a close approach. In addition to our morning and afternoon photography sessions, our indoor sessions will cover light angle, composition, in-the-field techniques, long lens techniques, wildlife panoramas, Photoshop and more in the comfort of a restored Millinocket home. Transportation will be by van. For compete details click here: www.wildscapeimages.biz/storage/Maine-Moose-PIW.pdf. E-mail Robert at wildscapeimages@comcast.net or give him a call at 407-808-4717. 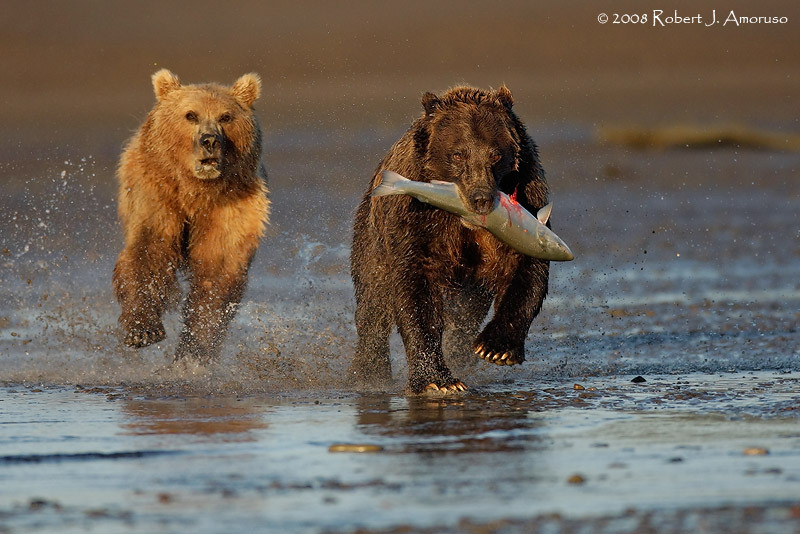 Coastal Brown Bears (Grizzlies) catching salmon, Horned Puffins, majestic landscapes and more. 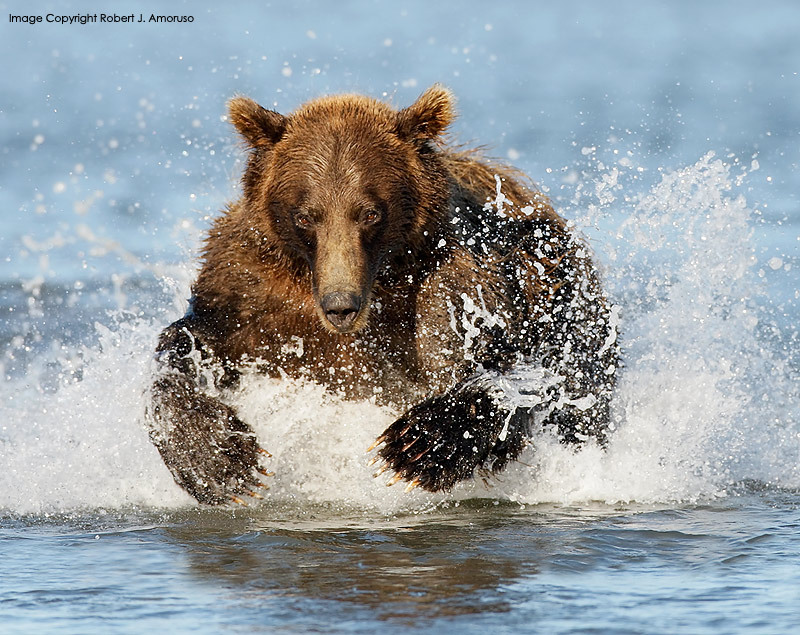 Join Robert Amoruso for a unique adventure; photographing Coastal Brown Bears who gather to catch salmon on Cook Inlet at the mouth of Silver Salmon Creek. We arrive the morning of 14 AUG and depart on the afternoon on 20 AUG: 5 full and two half days of photography. Accommodations at Silver Salmon Creek Lodge on Cook Inlet. In August of 2007, Robert co-led a workshop with Artie Morris here with great success: www.birdsasart.com/bn240.htm. Indoor sessions will cover light angle, composition, in-the-field techniques, long lens techniques, grizzly panoramas, High Dynamic Range Imaging, Photoshop and more. You must be in Anchorage on 13 AUG for the early bush plane departure on 14 AUG. The fee includes round trip bush plane flights, lodging, all meals at the lodge, guide services, transportation to and from shooting locations, and in-the-field and computer instruction. Travel to and from Anchorage and meals/accommodations there are not included. For complete click here: www.wildscapeimages.biz/storage/SSCL-Bear-PIW.pdf. E-mail Robert at wildscapeimages@comcast.net or give him a call at 407-808-4717. 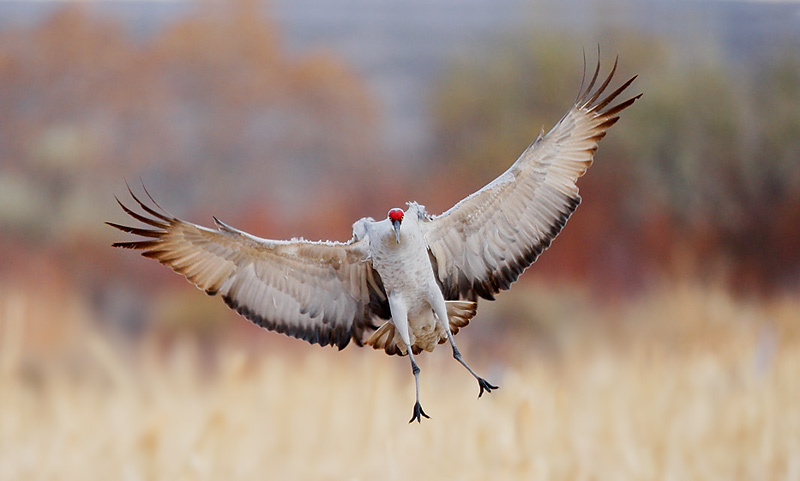 This image was awarded top-ten honors in NANPA’s 2008 Member’s Showcase Competition. Thanks to Artie and to our expert Silver Salmon Creek guides for putting us in the right place. This image created by stitching two separate images using Photoshop’s Photomerge. According to our host, David Coray, we will be visiting during the usual peak of the salmon run…. SW FLA POST X-MAS IPT: DEC 27-29 or 30, 2008. Slide program on the evening of DEC 26. 4-DAY: $1799. (3-DAY OPTION: $1349). Limit: 10/Openings: 5. Co-leaders: Robert O’Toole and Alfred & Fabiola Forns. This IPT is shaping up to be a practically private affair; we may very well wind up with more leaders than participants. If you can fit this IPT into your holiday schedule, do consider joining us. There is some truly great photography available in Florida while winter is setting in in most of the country... Call now for late registration discount: 863-692-0906. Rates for the 2009 trips have increased due to increased fuel costs. Bear Boat #1 (cheaper by $250 as we use the float plane only once): $6749. Bear Boat #2: $6999. Three slots are filled on each trip. Bosque 2009 IPT: “The Complete Bosque Experience.” NOV 21-27, 2009. Slide program on the evening of Friday, NOV 20. 7-FULL DAYS: $3199. Limit: 10/Openings: 10. Co-leader: Scott Bourne. Non-refundable deposit: $500 per person (Deposits may be paid by check, Paypal, or credit card.) Please note our new cancellation policy: A non-refundable deposit is required to hold a spot for each BAA IPT, Photo-Cruise, or Photo-Safari. Payment in full (payable only by check) is due four months before the start of the IPT and is non-refundable unless the IPT sells out (10 in this case). You will be required to sign a statement to this effect. Travel insurance is of course highly recommended. We regret that we must implement this new policy but we have had seven cancellations for the Post X-Mas IPT alone. (The new policy covers only the Bosque 2009 and subsequent IPTS, Photo-Cruises, and Photo-Safaris. Canon 800mm f/5.6L IS lens with the 1.4X II TC and the Canon EOS-1D MIII on the Mongoose M3.5 (http://tinyurl.com/68nxhy) atop the Gitzo 3530 LS CF tripod (http://tinyurl.com/65edtk). ISO 400. Evaluative metering +1/3 stop set manually: 1/1000 sec. at f/10. 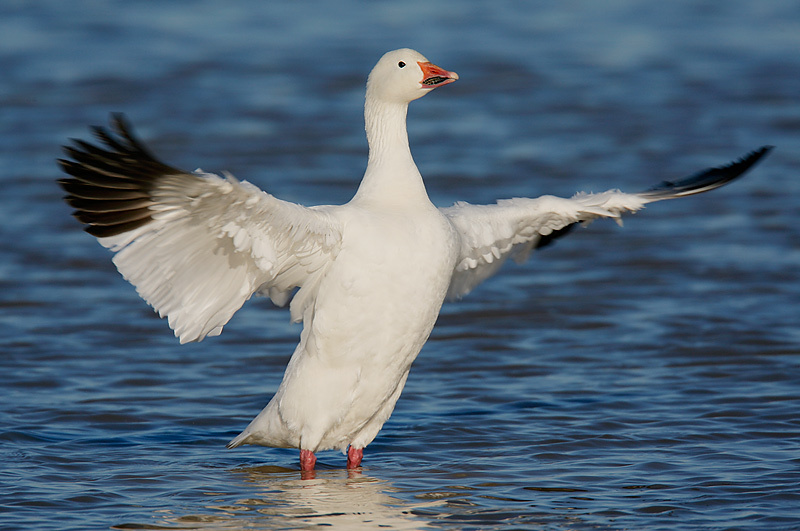 For a short while large flocks of geese were roosting in the southwest corner of the main impoundment. This opened the door to some great opportunities.